There is a "celebrity blogger" being sued by the paparazzi: a rather ridiculous thing by the sound of it. I find it deplorable for people to stalk and otherwise harass other people in the guise of "freedom of the press" simply because photos and stories (true and otherwise) of those being stalked bring in big money. It's truly disgusting and should be illegal. On the other hand, this blogger is making money from those doing the stalking by doing something unquestionably illegal: reprinting photos taken by others on his blog with no permission and no credit given. This is outright copyright infringement. He is claiming "fair use" under the copyright act. As a writer/artist, I have studied the copyright laws enough to know that the way he is using the photos, by drawing a couple of scribbles on them and sticking rude captions underneath, is not at all fair use. Fair use was issued for educational reasons. It gives us the right to use quotes as long as they are brief and acknowledged. It also gives us the right to show photos of artwork for an educational purpose, again with credit given. While checking into the creation of my own website, I read that section thoroughly: the one he is quoting as fair use that says if he changes it, it becomes legal. That's not what it says. It says there must be a considerable change and even then, the law is hazy and it would come down to how and why it's being used. In general, if it is being used for purposes of making income, it's not legal. The biggest issue is whether it interferes with the owner's income as competition. That is a cut and dry illegal act. I'm mentioning this here because of the widespread copyright infringement happening online. It is not legal to copy photos/graphics/text online and use it for your own purposes without express permission from its owner. That goes for any kind of art, including literature. One of the comments in that blog mentioned something I've heard ranted about before; that copyright laws should be repealed. This apparently comes from those who have never in their lives created an original work and never intend to do so. My question to those people would be, "Why should everyone except artists expect to make money from what they do?" Or, "Why should certain artists be allowed income from their work while others aren't?" When a man contructs a beautiful oak rocking chair from his own labor, no one is allowed to walk into his house and take it away. It's stealing and it's illegal. When I sit down and write or create graphics, I am putting my time and learned craft into it in the same manner and my work belongs to me. The photos I take and include in my blog and on my site belong to me. Copying them without my permission is stealing. The same goes for everything anyone creates. A photo is a creation. It takes skill and knowledge and effort to create a good photograph. I disagree about the ethics of the paparazzi, but it is not illegal. Even if it were, two illegal acts do not cancel each other. Copyright infringement is illegal. Plagiarism gets college students kicked out of school and adults fined. It is all the same issue. Art is meant to be shared with others, by permission of the artist. It is not meant to be stolen. Most often, if photos are used and linked back to the owner's site with full credit given, there isn't an issue made of it, especially when it is on a non-income-earning site. Some artists would welcome that as additional exposure. However, they could very well make a legal stand if they chose to do so, even with full credit. The bottom line is that artists deserve respect for their work. They deserve the same protection others have when it comes to earning a living. Grabbing art that is someone's livlihood (or even if it's only a hobby) is the same as walking into someone's house and pulling out one of her belongings. If we wish to continue having art in our society, we must continue respecting our artists. How close should a writer get to her public? The same could be asked of any artist, I suppose. I asked this in my other blog, one mostly read by other writers, and received varying answers. Writer's Digest also covers the question in this month's issue. The majority consensus seems to be that readers appreciate being able, with the internet, to connect more closely with their favorite writers and that it is also helpful to writers to be able to receive such personal feedback. I think there is a fine line and determining when it's crossed can be tricky. Mountains may be more clearly visible from a distance, but there are wonders about them that only those who get closer can know and learn to truly appreciate their inspiration. Artists are fairly mysterious creatures to others and that mystery can be a good thing; it helps to create an aura around their work. Too much mystery, though, can lead to detachment. Look at characters in novels who are under-developed. They may be going through exciting or horrendous adventures, but unless a reader can delve in far enough to see who they are inside, why should they care how the adventure unravels? I have many favorite artists of all types. I can admire their works and enjoy reading/listening/viewing. Still, there is a distance that equates to one who sees the bare outline of a mountain and thinks it beautiful, knowing nothing more. Why do so many of us wish to meet our favorite artists? Because it gives us the opportunity to walk up that mountain path and see what kind of trees are growing on it and from where the colors and shadows stem and what else lives inside its depths. It creates a different kind of awe, a more visible relationship that helps us connect further, and to care more. The advent of online communications with not only authors but artists of all kinds allows for an experience so few have been able to afford in the past; a chance to "meet" the creator and look inside its depths. Artists should take care, though, not to reveal anything that gives too much away about their work. Their creations need to stay distant to an extent, to stay mostly hidden until completion and then to maintain a bit of mystery. There needs to be an allowance for the audience interpretation. I adore that rare opportunity when I get to hear a reader's interpretation about my work. It so truly shows that a writer is only part of the equation. Each reader brings a uniqueness to the work that helps make it more personal to her. That boundary needs to stay uncrossed. I would love to hear thoughts on the issue from writers and readers alike. A note: With the holidays upon us, my weekend entries may slow or cease until January. 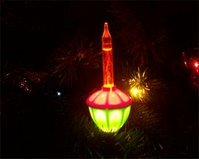 I wish you all a Beautiful Christmas/Hanukah/Al Adha and a wonderful 2007! Many times during Nanowrimo, I nearly threw my hands in the air and said, "I GIVE!" I ended up pushing through. In fact, the closer I got to the deadline, the more determined I was to finish, to not only hit 50,000 words, but to finish the whole first draft. Averaging 3,000 words a day the last week, I made it there on November 30th, with over 51,000 words. I've never written a novel that short, but then, this is my first youth novel, and it's long enough for 13 - 15 year olds. It will likely end up shorter than that once I take out everything that doesn't have to be there and tune it, turning it into something readable. It doesn't yet have a title; since I wrote it for my son, I'll ask his help in naming it. I'm letting it rest during this month and will hit the editing in January after it's had time to settle and I can go through with a more vivid and distant eye. I have plans of publishing by May. It's a possible goal since it is a shorter novel. On the last day, I also spent a bit of time browsing the Writers Beware blog (link on the left) and found an entry about how a high percentage of Nanowrimo authors are being scammed by "publishers" and "agents" because so many Wrimos are new to the writing craft and susceptible to those offering the flashing star of having a book published. Yes, I suppose that happens, but I have a hard time believing it happens to Wrimos more than to others. Have you spent time at Yahoo Answers? I am often there perusing the books and authors questions and am highly disdained to see how easy so many people believe the whole writing thing to be. One asked if there was someone who could help do the "details and descriptions" and such. She had an idea and decided it should be a novel. *sigh* I imagine I won't get any thank yous from telling her that ideas are a dime a dozen, but that's the truth and she needed to hear it. She likely also didn't appreciate my telling her that learning how to write details and descriptions is part of the writer's job, or that if you don't want to spend hour after hour editing 2,3, or 4 times after the first draft, don't bother with the first draft. Was that harsh? I run an indie-publishing group. One of the things I stress is that it's not the easy way out. It's harder, in fact, not to get it published, since anyone can do that now, but to get something marketable published and out there and reviewed by someone other than family and friends. I cringe when I see self-published books that come off as though they are first drafts. Likely, some of them are. It hurts all of us when hobby writers do that. And I say hobby writers because studying, editing, learning, and then editing more is part of writing. There is a difference between those who write for fun and serious writers intent on constantly improving and learning the craft and studying the production process and marketing strategies. It's hard work. An idea does not make a book. Of course, there's a place for actual vanity books. Having your family history in print to give your grandchildren is a nice idea. Putting down a story in your head and getting a few copies in print is nice. Anyone should have the right to do that. It is vanity, and it's fine. Your family won't care if you have spelling errors or extra information or an undeveloped writing style. Anyone who pays money for your book, however, most certainly will. The scam comes in when someone tells you not only can they publish your book, but that you will make money from it. Many other questions I found about the publishing process and financial outcome of writing a book were answered by those saying immediately, "publish it yourself and you'll make money" or "get an agent so the big companies will accept it." *sigh* Yes, because it's really that easy. (sense the sarcasm here?) I have spent too much time there trying to clarify the process, to steer unknowing victims away from paying an agent to accept you as a client [legit agents do NOT ask you for money -- they get paid from selling your book! ], or from thinking because they have a complete draft of the book that they can find a publisher, or that it's only real publishing if one of the big traditionals accept you. The big companies produce only a small percentage of books published each year. Small companies are producing much more, because there are so many more of them. I have echoed myself saying that who publishes a book is less important than how much work the author puts into marketing. Also, being published by a big company does not necessarily equate higher quality. It only means you wrote in a currently hot-selling genre and the book wasn't too awfully hard for editors to help spiffy. At the moment, I'm reading Diana Gabaldon's Outlander, published by Bantam Dell. It's a good story, has sold well enough to reach New York Times Bestseller status, but is in desperate need of editing. I find it unbelievable how much work should have been done on it before final publication. There are many scenes that are completely unnecessary and do nothing more than make the book longer or to show off the author's knowledge of something or other. There are repeated words, changing tenses that throw the reader, and sentence structures that could use much improvement. The beginning was nearly the end for me, as stiff and pretentious as it sounded. Its saving grace is one character, who is not the main character. I can't find it in me to like the protagonist, or to even sympathize with her. I often know where the story is leading before it gets there. Still, it was her first novel and I can hope the next several improved. While reading bestselling books and finding so many things that could be improved, I am both irritated and energized; energized because I can see that with consistent work, it is easily possible to write at least as well. Irritated ... because books that are indie-published are quickly negated although the writing is at least equal quality. There are some that are. The difference is we have to work much harder to prove ourselves. We may not do it willingly, but if we are serious, we will do it. 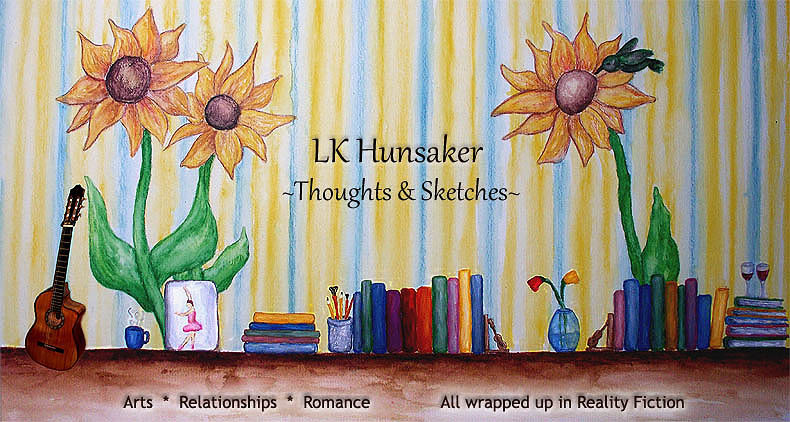 Go to the poetry section and scroll down to LK Hunsaker. Then please, come back and let me know what you think. I can take it. Writers must develop thick skins.